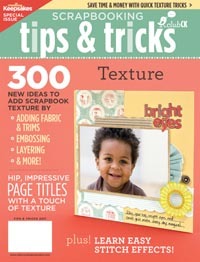 Creating Keepsakes has a new special issue available...this one focuses on adding texture to your layouts. "Adding texture to your layouts is one of the best ways to make your scrapbook pages stand out. In Scrapbooking Tips & Tricks: Texture you'll find ways to add texture on a budget, discover eight ingenious ways to add texture to your titles, and you'll even learn how to easily add faux hand stitching to enhance your layouts. This issue is also full of great tips on organization, creating quick pages, and journaling ideas. No matter what your skill level is, you're sure to be inspired to make truly touchable pages." This new issue is available at CK's Scrap & Paper Shop for only $5.99. Lucky for you, I've got a free copy to give away to one lucky reader!! To enter, all you have to do is leave a comment to this post by 5 p.m. on Thursday, February 10, 2011 answering the following question and you'll be entered for your chance to win! a) oh-so-lushess to touch and often too thick for a page protector. b) smooth as glass and flat as a pancake. c) somewhere inbetween a and b.
Random.org will choose and I will announce the winner on Friday.